This year we’ve decided to do something different for the New Years: a Central Park Midnight 4-miler, which is more of a party than a run, but the running of a 4-mile distance on New Year’s, at midnight, is involved. The event goes like this. 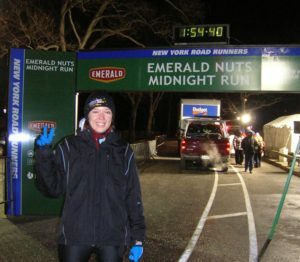 First, there is a two-hour party in Central Park around the bandshell, then, before midnight, we count down the seconds while being lined up for the run, and at midnight the Park’s fireworks start, and the crowd gets moving, beginning a four-miler. Fun! Somewhat crazy chilly fun. CNN covers this run in their New Years’ broadcast; we saw it a couple of years ago and thought those runners were crazy. And there we were, running it ourselves this year. The downside: it was freezing. The temperature went down to -10C (14F), with the wind chill of -23C (-9F). No matter, we though! We are from Canada, and we are skiers — we know how to dress for the cold. Well, yeah, except that we ski outside when the temperatures are this low, we don’t run outside in this kind of weather. My feet, in my running shoes, were so very cold. You just cannot fit enough socks into a running shoe to be warm and comfortable in such temperatures. Of course, once you start running, you are toasty warm (Canadian layering skills come in handy there); it is being warm before the run that is the tricky part. Changing right before the run is probably the only way to keep the feet warm; I was not the only one with this problem — before the run, people hurdled around some device that was blowing lukewarm air, putting their feet under that flimsy source of heat. At the finish line two hours before midnight. See the bundled-up folks in the background? It was a very, very cold night.Yes, it was very cold. There was a water station at the end of mile 2, and the water got frozen, was covered with a layer of ice. “Just give it a little tap”, the water station volunteer said cheerfully. The upside: it was fun. Tons of people, party-party-party; very good clean fun with minimal amount of liquor (we saw people opening a bottle of champagne on the race course, but didn’t see anyone drunk or even tipsy… At the running party and on the course, that is. On the way home, the people from the run were the only sober ones). There was a dance party before the run, which was fun, but, dance-wise, must have looked quite pathetic as people were not so much dancing as crowding together and shuffling in place to warm up. The count-down, and even the subway trips there and back (where we were surrounded by the other runners) were fun. Runners’ crowd had a very positive energy, a good sense of some joint experience and achievement. Oh, and people out in the park were cheering on us throughout the whole course, which was very nice of them. Summary? Loved it, it was different and fun. Would I do it again? A run in -23C with windchill at nighttime? Maybe not. This run, in better weather? Absolutely! This entry was posted in Achievement, Off the beaten path, Races, Running, Sports. Bookmark the permalink.